This is me just searching for someone to voice act my OC for another gig/minecraft roleplay. Sorry, but I'm only looking for someone that can pull off a male voice. Not stereotypical male, but just male enough to be able to differentiate from a girl's voice. -There are no age requirements. -Have a way to communicate, Skype and Discord seem to be the most popular, but preferably Skype. -Be okay with weird plot created by moody, overly random teens and tweens. A +1 if you can also be weird and edgy so we won't be intimidated, by your elder dominance or innocent mind. -And please DO check out Crystal Hollow by penguin-queen because that's the main reason I made this project. To put my OC in. Personally this is still a work in progress, and so is the actual roleplay it is meant for so you'd probably have to wait a while before a stable part is established, but as of right now Zephaniah is going to be the possible best friend of the main character, Charlotte in Crystal Hollow. Almost like a Aphmau and Zane thing, and yes I know I'm Aphmau trash, but still. Zeph is going to be a supporting role, but I do believe there will be times where you have to voice a lot of lines in the future. The seriousness of the role is at the level baby. I'm sure it can go up from baby-hated by dogs mail man so be flexible. I know I'm giving a lot of demands, but I'm an incredibly picky person when it comes to OC's. There is a reason why they're all cringe-y. Zephaniah Typha is a cringe-y OC I made quite recently and plan on incorporating into a casting call I'm joined in, but since I don't have a MAN enough voice for it I'm heading to CCC once more. Zephaniah is a normally opinionated, edgy teenager/emo, but since the RP is in a medieval fantasy like time it'll be somewhat harder to incorporate some stereotypical norms. He is quite blunt and values honesty and fairness. 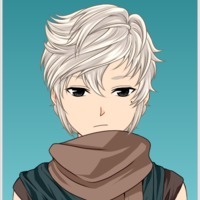 He is stubborn and while seeming cold and aloof cares a lot about other people, but doesn't show it. On terms of sexuality I'd assume he's mostly hetero because of the time, but is more of a demi-sexual (I don't know LGBTQIA terms to well, so pardon me if I'm incorrect) a person who will only experience romantic interest after a deep bond is formed. He is very loud and passionate about certain things: such as family, justice, and keeping a timed schedule for when he waters his plants. Despite his weird nature he attracts many people with his sense of justice and understanding of how to deal with them in certain emotions. I'd expect him to have a slightly deep voice, that is purposely paced so people can understand him, hence the caring about other people thing. If you plan on auditioning I thank you in advance because finding male actors is quite hard, especially if I'm searching for them like this. P.S. The RP I was talking about is Crystal Hollow by penguin-queen.